Bananas are a little pricey this week, so you may want to wait until they come down a bit. In a medium bowl, use an electric mixer to beat whipped topping, cream cheese, instant pudding and powdered sugar until well blended. Stir in bananas, pineapples and chopped cherries, mixing lightly. Chill 1 hour. Spoon 1 tablespoon of filling into each shell. 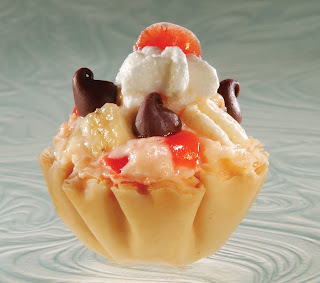 Garnish each with dollop of whipped topping and chocolate chips and top with a cherry half. Serve immediately.